Last edited by 1 on Reverend Hedgash, edited 0 times in total. 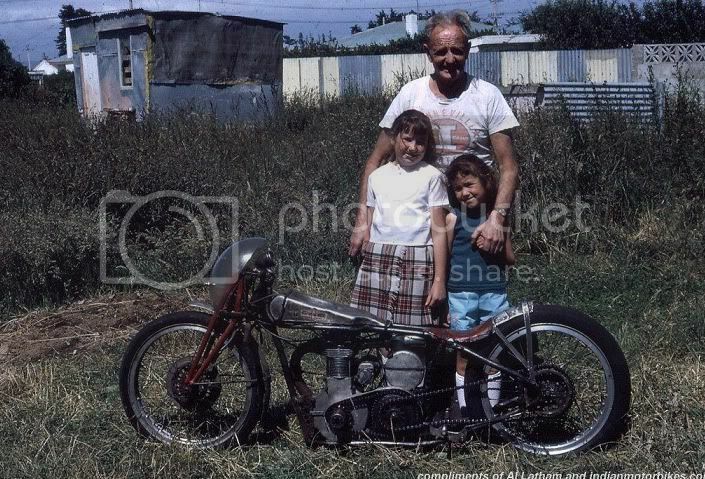 Any Burt Munro pics welcome . Try the book that was published last year .
" The worlds fastest Indian " by Roger Donaldson . no no no not to be confused with the book brought out about 5 yrs ago called " one good run "
I only bought the Roger Donaldson book about a month ago . At a guess probably 400 + photos and is 288 pages , and you also get a dvd of the 1970s documentary " offerings to the god of speed "
I haven't got that one but there are 2 other books by Tim Hanna on Burt as well. The one by Tim on his own is good, the other reads like a cartoon version of the movie. You also get "Offerings to the gods of speed" doco in the collectors edition DVD. There are two original bikes ! The one pictured is an original that was restored by Steve Huntzinger and currently owned by Tom Hensley. This bike is in America. the other one resides in an old timey hardwear store in Invercargill NZ. The pictured bike is absolutley imaculate , the one in NZ is more to the finish that we usually see. Rodger Donaldson had known Burt for years and in the 70's they went on a road trip around NZ . I met them in Auckland .I was an apprentice back then and my tradesman was a madkeen motorcyclist so we all went along to this meet and greet evening where we listened to Burt tell us about Speed records ,both in NZ and the USA ,in between stories of his meeting friendly American Women.. I found it hillarious that he would get jobs on freighters travelling to the US so he could make bits for engines in the ships engine rooms and get paid for it . What must not be forgotten is that motor cycle speed trials and beach racing in the South island had a very long history going back to the early 1920's. If anyone wants to look further into this,search out back issues of New Zealand's Beaded Wheels magazine (the Vintage car clubs official mag) from the 60's and 70's where there are lots of first hand accounts of racing early Harley's etc etc on the beaches. Brilliant motorcycle mechanic ....... Couldn't quite get his head around the workings of a lawnmower..